Well, I bought myself a fighting game and a hockey game broke out. I think the saying goes something like that. 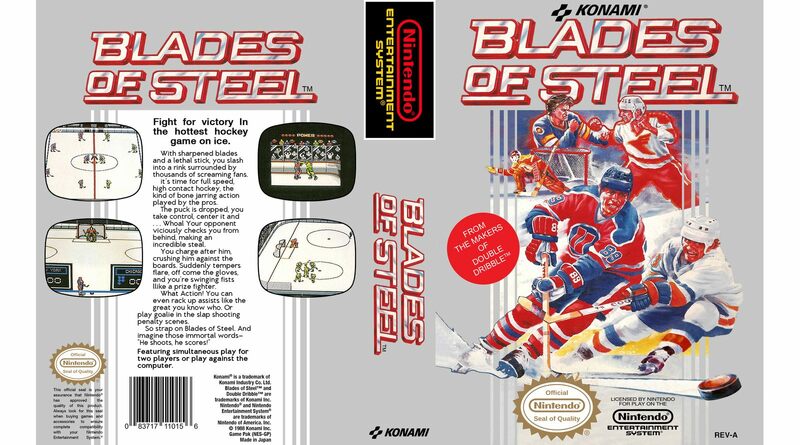 Konami has released their version of a hockey video game in Blades of Steel. And yes, it does include hockey fights. The big question, though, does it play better than Nintendo’s Ice Hockey, which came out earlier this year? When you first turn the game on you are greeted with not only a screen showing the game you are playing but also a voice telling you “Blades of Steel.” I like this little touch and it continues through the game. In fact, I felt the production as a whole was very well done. Along with the title screen vocals there are other examples of voice work throughout. The announcer will announce face-offs, fights, and passes. The last of which will get either very old or very entertaining for you, depending on how you look at it, as it can happen quite often. Along with the sounds are some pretty nice visuals. You move left to right or right to left on the screen. Players are clearly defined and it was easy to see which player I was controlling, as that player would flash. Each team has its own colors and never do I struggle to figure out which team someone was on. I also really appreciated some of the nice little visual animations, including celebrations with stadium music after a goal is scored and the jingles as the period is about to begin while the players skate around the ice as if getting ready to play. Well, the game looks and sounds pretty good, but how does it play? Now, this is where the opinions are going to lead to debates in the Ice Hockey vs. Blades of Steel debate. For me, it is one of the best controlling sports games on the system. I really like the flow that the game gives, and to me that’s what I want in a hockey game. Players move well as they skate around the rink and the two buttons are a simple pass and shoot. There is an arrow on each goal that is constantly moving up and down. This is where the puck will go when you shoot. To counter this you can control the goalie as well and keeping him in front of the arrow can be a bit strategic, as you have to balance that with controlling your other players to try getting the puck back. One of the things you can do with the other opposing players is keep bumping into them. Why? Because this is how you engage the fighting game. Once players have hit/bumped each other enough times you enter another screen that features just two players and dots over their heads. Those dots represent the players’ power. You then use the two buttons on the controller to hit or block. The first to eliminate the dots from the other person wins the fight. The winner of the fight gets the puck and that team gets a five on four for a period of time. In other words, winning fights gives the other team a penalty and you a power play, a huge incentive to come out victorious in the fighting arena! So, I’ve talked all about the presentation and gameplay so how about some extra details? When starting the game you have the choice between playing an exhibition game or a tournament. Exhibition is simply a single game and a tournament is an eight-team mode that awards the winner a trophy. The game consists of eight teams total that are all based on cities in North America. Along with this the game gives you the option of three difficulty options of Junior, College or Pro. One other little detail that makes this game entertaining to me is that at the end of the 2nd period the game will show you a short cut-scene, or if you are lucky, you’ll get to play a mini-game where you control a space ship shooting enemies (Gradius anyone?). These seem to be simply advertisements for other Konami games, but I really enjoyed how they are presented. Overall I really like Blades of Steel. It gets the nod over Nintendo’s Ice Hockey for me. If you want to make an argument that Ice Hockey is better for you, I can’t argue against that. Whatever style you prefer I think you will definitely get a lot of entertainment out of Blade of Steel. The controls, presentation, and overall flow of the game are really entertaining, and those are the most important ingredients to a fun sports game. You’d have a hard time trying to find a more enjoyable hockey (or heck any sports) game on the NES. Everything, from the presentation to the gameplay, combines together to make this a must-have NES game for you and your friends.